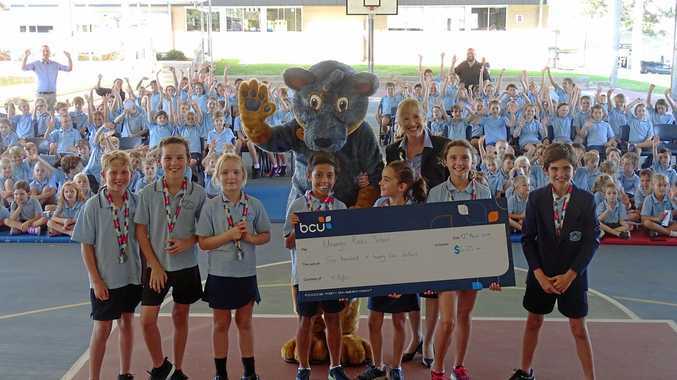 SPORTY SCHOOL: Urunga Public School students receiving their winning cheque from bcu mascot Scoot. TRIATHLON: The winning schools in the 2019 Scoot for Schools Cup have been announced with Glenreagh Public School, Urunga Public School, Bishop Druitt College and St Augustine's Primary School claiming victory. The Scoot for Schools Cup is an incentive of the bcu Coffs Kids Tri to encourage primary school students to do something active in their local community and give their schools a chance to win sporting equipment. The 2019 Coffs Kids Tri attracted almost 300 primary school students from 25 schools across the region. The schools with the highest percentage of participants, based on school size, were awarded Hart Sport vouchers ranging from $625 to $1125 to spend on sporting equipment. The winning schools were presented with their Hart Sport vouchers this week by bcu's mascot Scoot. "We were very excited to hear we had won the small school category and are thrilled to receive the Hart Sport voucher,” Urunga Public School's assistant principal Kevin Patterson said. "The school is looking forward to purchasing some new sports equipment and also storage bags for taking our gear to games and Gala Days. bcu Coffs Tri event director Sinclair Black said it was fantastic to see so many school students getting involved and it was a very close contest in some of the divisions. "The Scoot for Schools Cup is a great incentive to encourage students to take part in a local community event, not only to achieve something for themselves, but also to help their schools,” he said.